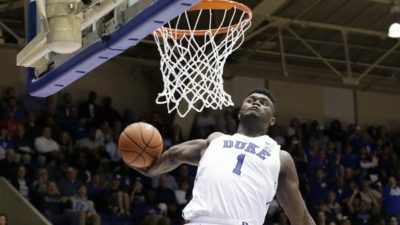 2019 NBA mock draft #2 : Who else but Zion? After a few games in the NCAA season, Zion Williamson has already shut down critics and showed why he was so hyped as an high schooler. A handful of other freshmen may join him in what could be a very talented top 10. I have to confess that I didn’t expect Zion to be that dominant. He has already been tested against Auburn and Gonzaga and was able to hold his own despite Duke’s first loss. Williamson is a monster in the open court, makes up for his lack of length with incredible hops and has displayed the ability to drive with both hands. He still has room to improve in every part of the game, above all on his outside shooting, handles and his moves back to the basket but seems a lock at #1. Barrett is a polarizing talent. Of course he’s a talented scorer and has shown versatility on the offensive end. Yet, he has to tighten his overall skills with only 40% fg including 31% from three, 62% ft and a suspect defense despite great physical tools. Barrett seems to force the issue sometimes and could be more efficient letting the game come to him and not trying to be the savior for the Blue Devils. Forget the lazy and bored high schooler, welcome to the potential five pick. A very unconventional player, Bol has erased all questions about his motivation after an average first game where he shot only 4/12 from the field. Bol is a jack of all trade as he can handle the rock, shoot from three (3/7 in five games) and of course rebound and block shots. He needs to keep working on his strength but his mix of agility/abilities for someone his size with is pretty impressive. Playing for a less hyped Indiana team comparing to the other big names in college basketball, Langford has confirmed his place among the top prospects. The lead guard has been able to create for himself and his teammates despite struggling from three with only 26% compared to a very nice overall 52% fg (only one game under 50%). He’s pretty active on D with 1st and 0.8blk. He already had a first positive test against Marquette with a win and a nice statline (22pts 5rbds 3st 2bl). If he can reach the 35% 3pt, he will become unstoppable. The third member of Duke’s triumvirat is as polarizing as his teammate Barrett. On the one hand, you got a smooth 6-7 forward who can shoot very well from three and sports the physical tools to be an efficient defender in the NBA. On the other hand, he seems to be content with staying behind the three point line as 19 of his 29 shots made were taken from deep. Moreover, he has yet to record one block in five games and doesn’t seem to be more than a potential three and D a la Otto Porter. Like another former Arizona State guard, Dort has taken college basketball by storm showing a drive which some of his fellow draft hopefuls lack. Despite two games under 40% fg, Dort has made up for it with 43% behind the three point line. Built like a running back, he may be the best rebounding guard of this draft with 7.8rbds per game. He needs to refine his game but got it all with athleticism and shooting to be an efficient guard in the NBA. Reclassifying to the 2018 class, Bassey has not wasted time and been efficient right away with Western Kentucky. He’s the middle man for the Hilltoppers and despite being doulbed, he shoots 55% from the field. He still must improve on cutting down his turnovers and looking more for his teammates (2.2tos for 0.8as). If he can get a consistent outside shot, he could climb some more spots. We know that it’s hard for freshman to be given the green light at UNC. It has not been different for Little. Despite his reputation as a top five freshman, Little is averaging only 20min per game which he uses pretty well with 13pts on 55%. In matchups against Texas and UCLA, He averaged 12.5pts but with only 8/21 from the field and a weak 1/6 from three. Little needs to be more consistent from three and display more versatility as he’s recorded 0 block/assist/steal over the last three games. Morant has only played in two games this season so we’ll have to wait more. He’s a triple double threat with great physical tools for a PG. If he can improve his outside shooting and cut down on his turnovers, he could be the first PG to hear his name and even crack into the top 10. The Seattle product has risen up to the top 15 despite being ranked as the 40th best high schooler last year by ESPN. He has been consistent in his first five games as he scored between 12 and 15pts. He needs to use the year to be a dominant scorer for USC and work on his outside shot, which could open more lanes for him to use his outsanding athleticism. Despite two games with 6 turnovers, Gafford has become a far better scorer with more 19pts a game on a stunning 72% fg. He already had two major tests against Texas and Indiana where he had 20 and 27pts. He will never be your major scorer with the pros but could be an upgraded version of Clint Capela alongside solid scorers. Gafford eeds to imorve his weak free throw percentage but his 9/10 ft against UT Arlington could b the first sign of a major improvement. On defense, his incredible mix of physical tools and athleticism allow him to be a solid rebounder and shot blocker, his calling card to start in he NBA. The best kept secret for the next draft has basically gone from playing U18 basketball in Serbia to playing US pros in a league full of NBA vets, and he’s playing well. Contrary to most european prospects, the combo forward was not playing pro in Europe. He had to adapt both to playing against adults and getting used to the US culture. He’s efficient from the floor and behind the three point line (52% fg 40% 3pt) and is the Warriors’s eight best scorer, scoring more than Gbinije, Deyonta Davis and even Warriors last draft’s first rounder Jacob Evans. Definitely a player to follow and a good advertisement for the G League. As a Frenchman, I’ve followed Doumbouya’s journey through the pros. Labeled early as the potential French Lebron, Doumbouya has stayed in his comfort zone by signing with poor coaches, which has prevented him from developing the right way. Now 18, he’s still the same raw forward who has to improve on everything from his shooting to his IQ or his defense. His physical attributes could lock him in the top ten but if the scouts don’t see any improvement, he could slip to the mid first round. Until yesterday, Garland was scoring like nobody with great % despite his small frame (54% fg 48% 3pt). Unfortunately, he hurt his knee and we’ll now wait to see how long he will be stopped. If he comes back healthy, he will need to work on involving his teammates more as he was averaging only 3.3as before his last game. There is no problem for an inside player to shoot from outside but he still has to keep doing what a big is supposed to do. That’s what Reid has to figure out. The LSU big man has shot 35% from three with a respectable 1.5 three pointer made per game, but his 4.2rbds and 0.75blk in 20min are average numbers for someone with his size. Over his last three games, Reid had only 7rbds in 73min including a mediocre 2rbds in 41min against Florida State. He really needs to show more toughness on the boards and in defense for his shooting to look like a bonus instead of his only strength. Bitadze still is underrated by most scouts but the way he destroys the Adriatic League despite being only 19 should have propelled him in everybody’s top 20. He scored 8pts more points per game despite playing only 4 more minutes and also improved on his outside shot with 33% from three. Former Mega Leks players Jokic and Nurkic already made the leap to the NBA with success so ther’s no reason that Bitadze doesn’t achieve the same feat. The Frenchman has a pretty interesting start for the Demon Deacons as he has been consistent scoring, rebounding and drawing fouls. A potential combo forward in the NBA, Hoard needs to be more efficient from three as he made only 2 three pointers over the first five games. A very raw prospect at his arrival, Hachimura has improved step by step and now looks like a surefire first rounder. Playing ten more minutes than last year, Rui has doubled his scoring average with an impressive 22.5pts with 59% fg and 44% fg. A good defender despite bad numbers (0.8bl 0.5st), the Japanese could be a lottery pick if he shows he develop a consistent outside shot with more attempts. After watching his teammate Zhaire Smith go from unknown freshman to lottery pick, Culver hopes to follow the same path. Culver has improved dramatically in his shot selection and assists number. Still has to fill his body but some tools that should interest the NBA scouts. After an impressive first game against MSU with 21pts 4as and 6/10 3pt, Grimes has struggled lately with only 14pts and 3as over the last three games. Grimes has the tools to be a solid combo with good shooting, a solid body and nice passing ability but he needs to bounce back ASAP and show more consistency or will slip to the second round. The bruising big man has started the season pretty well with 77% from the field, mostly on dunks over undersized defenders, and more than 2bl per game. Yet, Maryland has played average competition until now and Fernando has yet to be te tested against potential NBA players or at least solid inside players. He hasn’t shown the ability to score from three but could have found a way to mprove his ft after a good 4/4 against Marshall. The Canadian forward seems to be healthy after last year’s injury. He averages almost a double double and displays great athleticism. Now, as a PF, he needs to develop a reliable shot as he’s more a finisher at the rim than a versatile offensive player, and become a better shot-blocker considering his physical tools. Shai Gilgeous-Alexander’s cousin may follow a similar path as his cousin. After a good freshman year, Nickeil has improved dramatically in every aspect of his game as he doubled his coring averages but above all, tripled his assist and steal numbers while averaging better shooting percentages. An old sophomore, Hunter is your typical Philly baller, very fundamentally sound and tough player on offense and defense. He will never be a star but could be a very good starter as a three and D who whill defend hard and shoot from outside. If he was one year younger, he would be a lottery pick. After a first convincing test against Duke with 23pts, Johnson has been good but not spectacular with four out of five games with 15pts or less against mid majors. His shooting needs to be improved with 27% 3pt. He’s also active on the boards with more than 5rbds, an intensity he should bring more on defense. After a very good start, albeit against two mid majors and two division 2, Brown has struggled in his first tests against MSU and UNC. He took only 5 shots against MSU scoring 5pts to go with 10rbds and 3bl but couldn’t last more than 8min against UNC due to foul trouble. Brown has to work on many aspects of his game, mainly his moves back to the basket, shooting and overall strength. He has the length and agility to be a good player but that will require hard work. A 6-10 pogo stick playing for the Terrapins, Smith has been efficient right away on offense as the best inside scorer ahead of Maryland’s next prospect, Bruno Fernando. Smith has to improve mainly on two aspects of his game. First, his shooting as he scored only one three pointer. The other is his rim protection as 0.8bl in 25min is way too low for someone with his physical tools. After a good draft process, Konate decided to come back with WVU to become a more versatile player. He’s still the same very impressive shot blocker but has become enamored with the outside shot as he may be focusing too much on showing he can score from three (4/12), resulting in a poor 42% fg. He has been outplayed by surprising freshman top 10 prospect Bassey but that should not hurt his stock too much. Tyus’ lil brother has been the regulator of Duke’s offense and its wisdom despite being as young as the other freshmen. He is a very smart kid who has a 4+ as/to ratio and is shooting more than 50% from three. Even if he doesn’t possess elite physical tools, he could become a very solid back up PG in the league. Williams may not be the most glamorous prospect but what a player. A young junior (born in november 1998), he has been the best player for a very solid Tennessee team. The versatile PF knows what he has to do to help his team, scoring with very good percentages, helping on D while involving his teammates with a very good 4.2as per game. He already had three real tests against Louisville, Georgia Tech and Kansas where he has been very consistent. A very good glue guy at 30 if he keeps playing like he does.